Some countries fear a free flow of information through the media and often go to extraordinary lengths to ensure they maintain control over the distribution of news and information in their nation. While some governments are kept busy building media firewalls or other barriers to stop outside information being received by their citizens, other groups are just as determined to allow their views to be heard behind these barriers. Information can be diluted or restricted by many different methods. Some information is controlled via a relatively "light" non-technical approach, other "heavy" techniques use various technologies to jam or completely stop the flow of the information considered subversive. An example of a 'light" approach to control a media outlet may be the ridiculing of Al-Jazeera by senior members of the USA government. The anti Al-Jazeera campaign in the USA has led many in that nation to consider the broadcaster as an evil mouthpiece for Islamic terrorists and not ideal viewing by patriotic Americans. Meanwhile outside of the USA some view the station as un-biased and a shining example of a balanced media organisation. A "heavier" approach may include national restrictions and censorship of the Internet or jamming of radio and television transmissions that do not align to a particular belief. Two groups that definitely don't see eye-to-eye when it comes to beliefs is the government of the Peoples Republic of China and the followers of Falun Gong. Both parties have been accused of being players in a constant war to control the delivery of information, and interestingly part of the war is being played out over satellites. Falun Gong - Satellite Hackers? 2007 is seeing a massive reorganisation of the domestic radio and television services delivered by satellite links in China. Over recent years the Chinese have been exposed to an embarrassing series of hijacks of these satellite links. The hijacks have seen the official evening news from Beijing being replaced by Falun Gong programming. For many years the AsiaSat, Sinosat and Apstar platforms have been used to distribute media across mainland China. As a result of the hijackings the services are now shifting on mass to two new satellites, Chinasat 6B and Sinosat 3. The new satellites have been built with systems that are designed to prevent the hacking of the services. Chinasat 6B also plays another important role in the war of control of the Falun Gong, it is the source delivering the dreaded Firedrake Jammer to Chinese Radio Jamming transmitter sites. The Falun Gong's shortwave radio station The Sound of Hope is the main method of reaching their supporters in mainland China. 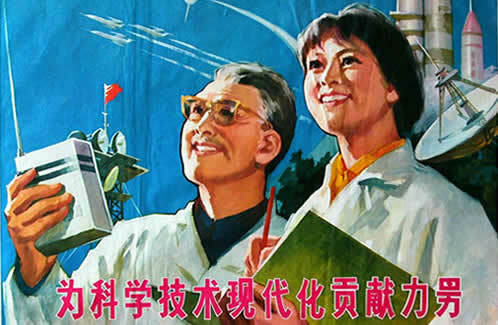 Sound of Hope programs allege persecution and torture by the Peoples Republic of China, and as you might expect, the Chinese go to incredible efforts to ensure the station is basically impossible to listen to by jamming the station. The Chinese Firedrake Jammer (also known as FireDragon) is a powerful transmitter that sits on top of the same frequency as the Sound of Hope. Firedrake covers the Falun Gong programming with loud Chinese Classical Music featuring gongs, flutes and drums. The Firedrake music is so intense that it usually completely dominates the frequency with the Falun Gong program underneath it becoming unintelligible. 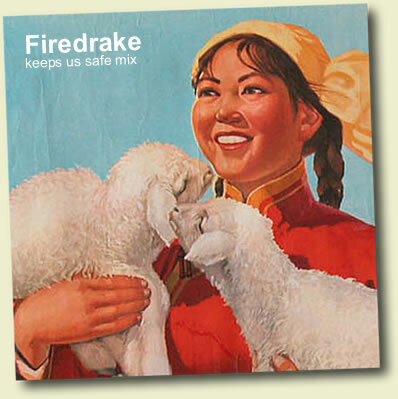 Shortwave Radio Enthusiasts and Ham Radio operators have been watching China's Firedrake with interest. They believe that the primary Firedrake transmitter location is on Hainan Island off the coast of Southern China, however it is believed that there may be other transmitter sites also in use. It has also been noted that the Firedrake audio is a one hour loop with no announcements. This got us thinking at Satdirectory; how does the Firedrake programming get to the transmitter site? Is it delivered by a tape or CD on repeat, or is it like most other Chinese radio, delivered by a satellite link to the transmitter? Well, a search with our 3 meter dish has found Firedrake! The audio is transmitted on Chinasat 6B within the China National Radio (CNR) satellite feed circuits. Many of the China National Radio feeds are in stereo, however one channel that is solely mono is CNR 8 - The Voice of the Minorities broadcast which features programs in the Kazakh, Korean, Mongolian, Tibetan and Uighur languages. The CNR 8 audio feed to the Chinese transmitter sites can be found on the left audio channel of a feed circuit labelled "Lzh8Rdjy". On the right audio channel of this feed is the audio for the Firedrake transmitters. Following our discovery we tuned up a shortwave receiver to 17780 kHz which at the time also had the jammer running. The audio from the satellite feed and the shortwave radio were synchronised with no delay. This confirmed that the Firedrake shortwave transmitter site was also being fed by the same satellite feed, otherwise we would have expected a delay of a second or so due to the satellite uplink and downlink path delay when compared to the shortwave broadcast. Satdirectory can confirm that the Firedrake audio program is exactly 60 minutes (down to the second actually) and we have made a full studio quality copy of the broadcast which can be made available on CD for study and academic use on request. We use our revolutionary Firedrake Signal to mask the evil poison of the Falun Gong. Satdirectory has produced a full studio quality copy of the Firedrake Jammer Broadcast. The CD runs for exactly 60 minutes and is a true digital copy of the audio feeding the Firedrake transmitters. The CD is available for study and academic use on request. Please note: The Firedrake audio may be covered by copyright. Satdirectory has made reasonable efforts (without success) to try and determine the copyright owner of the Firedrake audio. Satdirectory has also attempted to contact the Chinese Radio Jamming operators to seek permission to reproduce the Firedrake audio. Satdirectory is not selling the audio content on the Firedrake CD, it is supplying this content in good faith for educational purposes. There is however a small charge for postage, packing and duplicating costs of the CD. China National Radio and the Firedrake audio feeds are available via Chinasat 6B. 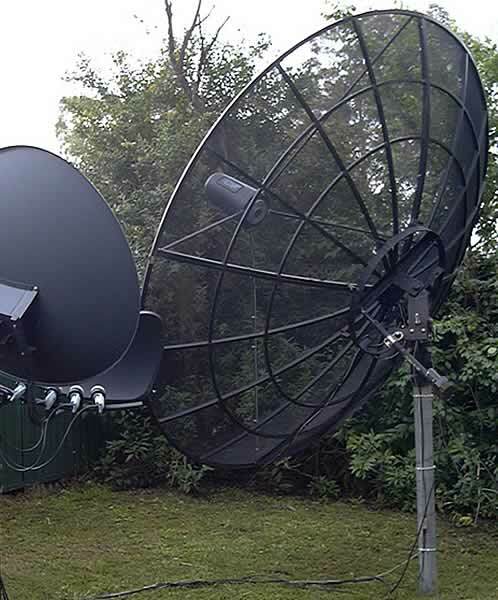 Satdirectory's 3 meter mesh dish is used to receive digital audio feeds of the Firedrake Jammer.